With the object of discussing and forming an Auckland Cycle Touring Association, a general meeting is to be held at the Physical Welfare Rooms, Fifth Floor, Houghton House, 47 St Paul’s St, City, on Thursday, 24th, at 7.30 pm. All persons interested in the formation of this association are invited to attend. – J P Brien, Convener. Phone 48-468. 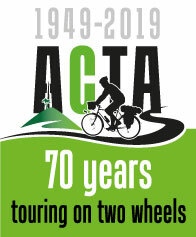 The meeting was duly held and The Auckland Cycle Touring Association was formed on 24 February 1949.